Here at vintagebulova.com we strive to bring you the best in quality vintage Bulova watches. Although we deal primarily in Bulova time pieces, from time to time others will be offered as well. Unless I specify otherwise, all watches have been fully serviced by a Master Watchmaker, fitted with new straps and are ready to be worn and enjoyed. For addition information on rare antique Bulova watches try this other great site. I prefer payment via PayPal. The "Buy Now" buttons on the sales page will take you directly there. United States Postal Money Orders are acceptable as well. If you wish to pay in this way send me an EMail and I will place the watch on hold for a few days. Please include your name, address, EMail, and phone number. In 1875 Joseph Bulova, a 23-year-old Czech immigrant, opened a small jewelry shop on Maiden Lane in New York City. 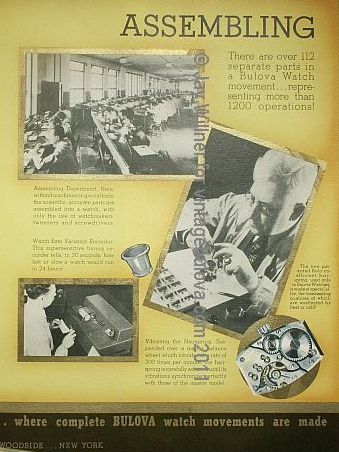 By 1912 Bulova had set up its first plant dedicated to the production of watch components and their assembly into jeweled movements in Bienne, Switzerland. In 1923 the name Bulova Watch Company, Inc. was adopted. Bulova perfected a new concept in the watch industry of total standardization of parts. Every part of a Bulova watch was made with such precision (standardized to the ten thousandth of an inch) that it was interchangeable with the same part in any other Bulova watch. 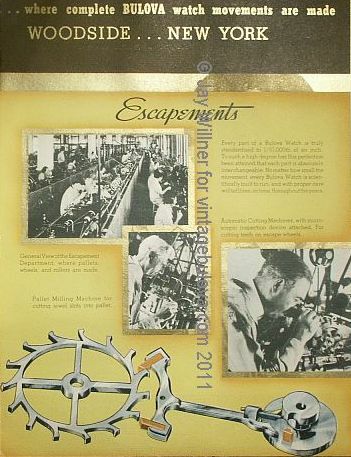 This revolutionized the servicing of watches in the industry. The Bulova Watch Company went public on the American Stock Exchange in 1927. In choosing a Bulova Watch, your personal taste need be your only guide. The name Bulova on the dial is your assurance that it will keep time, on time, throughout the years...At better jewelers everywhere. 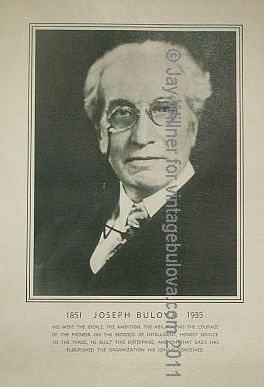 Joseph Bulova 1851 - 1935. His were the ideals, the ambition, the ability and the courage of the pioneer. On the bedrock of intelligent, honest service to the trade, he built this enterprise, and on that basis has flourished the organization his genius conceived. Bulova Watch Time in every home in America! 140 powerful radio stations broadcasting Bulova Watch Time every hour...every day...365 days a year! Bulova is the official timepiece for American Airlines Inc. from coast to coast! A tribute to the accuracy and dependability of Bulova Watches! Every hour of the day, an American Airlines plane is in the air. Every day, these Flagships fly 50,000 miles-twice around the world-by Bulova Watch Time! 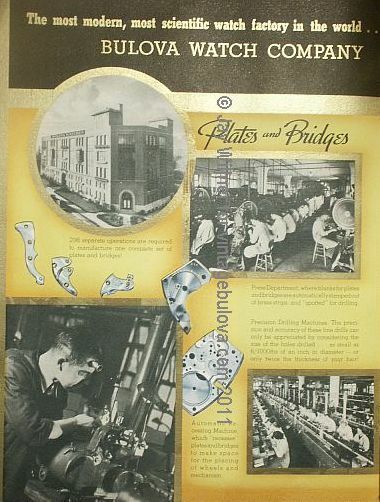 298 separate operations are required to manufacture one complete set of plates and bridges! Press Department, where blanks for plates and bridges are automatically stamped out of brass strips, and spotted for drilling. Precision Drilling Machines. The precision and accuracy of these fine drills can only be appreciated by considering the size of the holes drilled ... as small as 6/1000ths of an inch in diameter - or only twice the thickness of your hair! Automatic Recessing Machine, which recesses plates and bridges to make space for the placing of wheels and mechanism. Every part of a Bulova Watch is truly standardized to 1/10,000th of an inch. To such a high degree has this perfection been attained that each part is absolutely interchangeable. No matter how small the movement, every Bulova Watch is scientifically built to run, and with proper care will tell time, on time, throughout the years. General View of the Escapement Department, where pallets, wheels, and rollers are made. Pallet Milling Machine for cutting jewel slots into pallets. Automatic Cutting Machines, with microscopic inspection device attached. For cutting teeth on escape wheels. 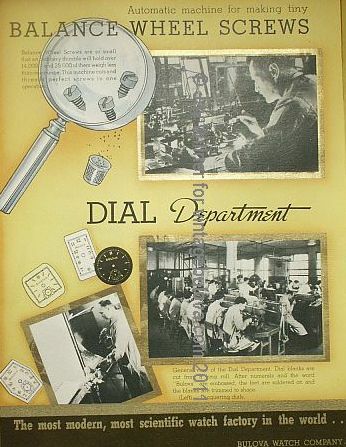 93 operations are required to make the pinions used in one Bulova watch. In this department are made the Center Pinion, Third Pinion, Fourth Pinion, Escape Pinion, Minute Pinion and Canon Pinion. Here, too, precision is highly important and parts are finished accurately to within 1/10,000th of an inch. Close-up of a Pinion Cutting Machine. This semi-automatic machine cuts gear teeth as tiny as 4/1000th of an inch in width! Polishing Pinions. After the pinions are cut, hardened, and tempered, they are highly polished to remove roughness and eliminate friction. Blanks for Mainspring Barrels are cut out of a long strip of brass. This machine then performs all the remaining operations, except cutting the teeth. Scientific measuring Instruments. These spotting and checking machines measure accurately to within 4/100,000th of an inch! Projecting Machine. Parts in production are continually checked. An image of the watch part being checked is thrown on plate glass, and can be enlarged from 10 to 100 times! Automatic machine for making tiny Balance Wheel Screws. Balance wheel screws are so small that an ordinary thimble will hold over 14,000 - and 25,000 of them weigh less than one ounce. This machine cuts and threads perfect screws in one operation. 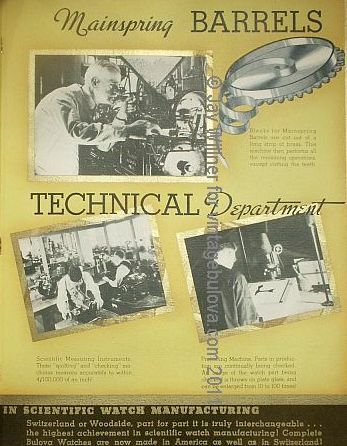 General view of the Dial Department. Dial blanks are cut from a long role. After numerals and the word Bulova are embossed, the feet are soldered on and the blanks are trimmed to shape. Lacquering dials. There are over 112 separate parts in a Bulova Watch movement ... representing more than 1200 operations! Assembling Department. Here, without machines or special tools, the scientific, accurate parts are assembled into a watch, with only the watchmakers tweezers and screwdrivers. Watch Rate Variation Recorder. This supersensitive timing recorder tells, in 30 seconds, how fast or slow a watch would run in 24 hours! The new Bulova patented Bulo-coefficient hairspring, used only in Bulova Watches, is made of special alloy, the timekeeping qualities of which are unaffected by heat or cold! Vibrating the Hairspring. Suspended over a master balance wheel which vibrates at a rate of 300 times per minute, the hairspring is carefully adjusted until its vibrations synchronize perfectly with those of the master model. Joseph Bulova, a 23-year-old immigrant from Bohemia, opens a small jewelry shop on Maiden Lane in New York City. Bulova begins manufacturing and selling boudoir and table clocks as well as fine pocket watches. These pieces are sold in unprecedented numbers. Bulova sets up its first plant dedicated to the production of watch components and their assembly into jeweled movements in Bienne, Switzerland. During World War I, the convenience of wristwatches (as opposed to pocket watches) is discovered. In 1919 Bulova introduces the first full line of men's jeweled wristwatches. Bulova Watch Company, Inc. moves to 580 Fifth Avenue and builds the Bulova Observatory on top of the building for the taking of sidereal time. This is the first Observatory ever built atop a skyscraper. The Observatory is under the direction of a mathematician whose readings are electrically recorded, instantaneously, on a chronograph hundreds of feet below the observatory, guiding the Bulova watchmakers in the Setting and Timing unit of the Company. The name Bulova Watch Company, Inc. is adopted. Bulova perfects a new concept in the watch industry with total standardization of parts. Every part of a Bulova watch is made with such precision (standardized to the ten thousandth part of an inch) that it is interchangeable with the same part in any other Bulova watch. This revolutionizes the servicing of watches. Bulova unveils the first full line of ladies' watches, including diamond-accented pieces. In the same year, President Calvin Coolidge presents a Bulova watch to Stanley Bucky Harris player-manager of the World Series-winning Washington Senators. Bulova designs a new watch in honor of the occasion and names it the President. Bulova produces the nations first radio commercial, At the tone, its 8 P.M., B-U-L-O-V-A, Bulova watch time. Ardre Bulova, Josephs son, offers a prize of $1,000 to the pilot who first succeeds in a nonstop flight across the Atlantic. In honor of Charles Lindberghs transatlantic solo flight from New York to Paris, Bulova ships 5,000 Lone Eagle watches, packaged with pictures of Lindbergh. The supply, which is available the day after the landing, is sold out within three days. During the next few years Bulova sells nearly 50,000 of these commemorative watches. Also in 1927, Bulova Watch Company goes public on the American Stock Exchange, and Bulova Canada is established. Bulova introduces the world's first clock radio. Bulova engineers and patents a new principle in the construction of automobile clocks. 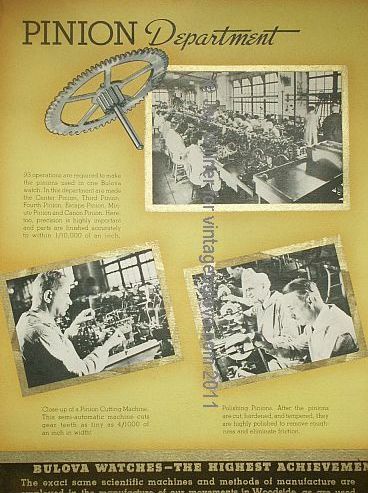 Bulova begins manufacturing the first electric clocks. The collection includes wall and mantel clocks, and clocks for use in stores, windows, office buildings, train stations and airports. Also, Bulova becomes the first watch manufacturer to spend more than $1 million a year on advertising. Throughout the Depression years, Bulova supports retailers by offering Bulova watches to buyers on time-payment plans. Bulova runs a "Name the Watch" contest for its new $24.75 timepiece, with cash prizes totaling $10,000. The top prize of $1,000 would be equivalent to about $12,500 in the year 2000. Joseph Bulova, founder of Bulova Watch Company, dies. 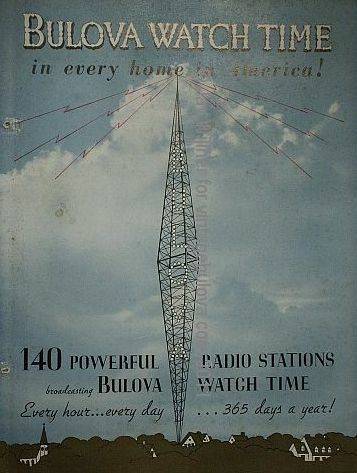 Bulova is a sponsor for all of the top 20 radio shows, including Charley McCarthy, Jack Benny, Fibber McGee and Molly and Major Bowes Amateur Hour. Continuing its tradition of advertising firsts, Bulova airs the first television commercial a simple picture of a clock and a map of the United States, with a voice-over proclaiming, "America runs on Bulova time." The 20-second spot costs $9. 1941 also marks the year that the Bulova Board of Directors, chaired by Josephs son, Ardre Bulova, adopts a resolution to sell products for national defense at actual cost. Throughout World War II, having perfected the skill of creating precision timepieces, Bulova works with the U.S. government to produce military watches, specialized timepieces, aircraft instruments, critical torpedo mechanisms and fuses. 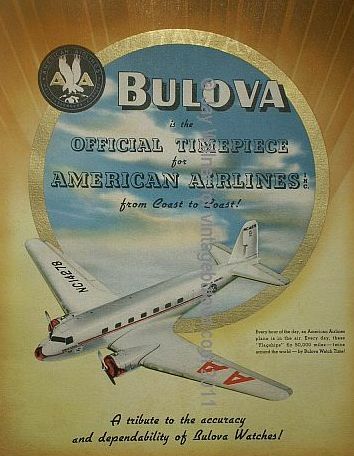 25% of all radio advertising was used to promote the sale of War Bonds and Stamps; "B-U-L-O-V-A...Bulova Watch Time...Time to Buy United States War Bonds and Stamps." The Joseph Bulova School of Watchmaking opens its doors to help disabled veterans learn watchmaking skills. Entirely supported by the Bulova Foundation, the school is equipped with state-of-the-art accessibility features, including automatic doors and extra-wide elevators. Graduates of the school are assured employment with over 1,500 positions pledged by American Jewelers. Bulova begins developing the Phototimer, a unique combination of photo-finish camera and precision electronic timing instrument. Bulova begins developing Accutron, the first breakthrough in timekeeping technology in over 300 years. Accutron, the first fully electronic watch, promises to keep time to within 2 seconds a day. Recognizing new trends in the watch industry, Bulova adds more self-winding and shock-proof watches to its line. Also added this year is the Bulova Wrist-Alarm, an entirely new kind of watch. Bulova introduces the Bulova 23, a self-winding, waterproof, 23-jewel watch with an unbreakable mainspring, made entirely in the United States. Omar Bradley, World War II general and retired chairman of the Joint Chiefs of Staff, joins Bulova as Chairman of the Board of the Bulova Research and Development Laboratories. An independent A.C. Neilson Company survey reveals that Americans see more national advertising for Bulova products than for any other products, in any other industry, in the world. Bulova completes negotiations to cosponsor theJackie Gleason Show" a one-hour live television show airing Saturday nights from eight to nine o'clock. This is the first time in history that any watch or jewelry-related company has made a sponsorship commitment of such magnitude. Omar N. Bradley becomes chairman of the Bulova Watch Company, a position he remains in until 1973, when he retires at the age of 80. Bulova offers an unprecedented 1-year warranty on all of its clock radios. NASA asks Bulova to incorporate Accutron into its computers for the space program. Bulova timing mechanisms eventually become an integral part of 46 missions of the U.S. Space Program. Also in 1960, Bulova reintroduces its redeveloped Phototimer clock for track and field, improved with updated photographic and electronic technologies. It features an infrared sensing element patterned after those used on heat-seeking missiles. Mounted on the starter's pistol, the Phototimer senses the flash of the gun and starts a timer clock at the same instant that the runners leave their marks. Accutron, the first watch to keep time through electronics, is introduced. It is the most spectacular breakthrough in timekeeping since the invention of the wristwatch. This revolutionary timekeeping concept of a watch without springs or escapement is operated by an electronically activated tuning fork. The Accutron watch goes on to become a presidential gift to world leaders and other dignitaries. President Johnson declares it the White House's official Gift of State. The Accutron Tuning-fork watch becomes the first wristwatch certified for use by railroad personnel. 1962 is also the year that Bulova introduces its Caravelle line of jeweled watches. Designed to retail at $10.95 to $29.95, Caravelle competes with non-jeweled watches in the same price range. Bulova runs national commercials for Accutron on many popular television shows including the Dean Martin Show and The Man from U.N.C.L.E. Accutron clocks are the only clocks aboard Air Force One. The Bulova Satellite Clock, the world's first public clock regulated by time signals from orbiting satellites, is inaugurated by Gustavo Diaz Ordaz, President of Mexico. The clock is installed atop the Torre Latino Americana, Mexico's tallest skyscraper. 1968 also marks the year that Caravelle becomes the largest selling jeweled-movement watch in the United States. An Accutron watch movement is part of the equipment placed on the moon by Apollo 11 astronauts, the first men on the moon. A Bulova timer is placed in the moon's Sea of Tranquility to control the transmissions of vital data through the years. Bulova introduces the Accuquartz, the first quartz-based clock. The Bulova Accuquartz men's calendar wristwatch becomes the first quartz-crystal watch sold at retail in the United States. Made of 18-karat gold, it retails for $1,325. Three specially designed Accutron portable alarm clocks are placed on board NASA's Skylab, the world's first space laboratory, launched from Cape Kennedy. Also this year, Bulova wins the world's first design competition for solid-state digital watches at the Prix de la Ville de GenÃ¨ve watch-styling competition, the world's most prestigious international watch-styling competition. Bulova also wins two of the three honorable mentions awarded at the competition. Bulova introduces its line of Accutron Quartz movement watches for men. Also this year, the Smithsonian Institution's newly opened National Air and Space Museum features a replica of the NASA Skylab. It includes an Accutron "space alarm" clock identical to the ones mounted onboard the actual Skylab. Bulova introduces its line of Accutron Quartz movement watches for women. Bulova runs a magazine ad campaign featuring Walter Cronkite, with the sloganGood News from Bulova." The company also places national commercials on many television shows including All in the Family, Charlies Angels, Starsky and Hutch, The Dukes of Hazard and Hawaii 5-0. Bulova becomes a subsidiary of Loews Corporation. Bulova heightens its profile by targeting young consumers with a television and magazine advertising campaign featuring Muhammad Ali, Morgan Fairchild, Cathy Lee Crosby, Bernadette Peters, Johnny Cash and Roger Daltrey. The Bulova Dimension is unveiled. It is the worlds thinnest wall clock, measuring just 5/8 of an inch. Bulova introduces its first miniature clock. Creating a new category of timepieces, Bulova goes on to produce entire collections of miniature clocks, including limited-edition pieces and themed groupings. Bulova becomes the official supplier to the U.S. Olympic team, providing watches for both the winter games in Calgary and the summer games in Seoul. Bulova changes its corporate name from Bulova Watch Company, Inc. to Bulova Corporation. This move reflects the companies growth into new and different product markets. Bulova produces an ad in record time. At the Winter Olympics in Calgary, a photograph is snapped on Saturday morning. Eight hours later an ad incorporating the photo is on the press in time to be in millions of copies of Time magazine on Monday. This year, with its new line of Swiss quartz watches, Accutron is relaunched as the premier brand of the Bulova Corporation. Bulova enters into a distribution agreement in South America and extends licenses in the Far East and Europe. A Gallup survey and the Fairchild 100 report rank Bulova fourth in consumer awareness in the combined watch and jewelry industries. Bulova introduces the Millennia Collection, a group of watches featuring innovative technology or materials. The collection includes a solar group, watches powered by light; motion quartz, watches powered by the motion of the wearer's arm; and vibra-alarm, watches featuring two alarm mode options sound or vibration. Bulova adds World Timer and Perpetual Calendar watches to the Millennia Collection. On October 4, Mayor Rudolph Giuliani proclaims Bulova Day in New York City, in recognition of Bulovas 125th anniversary. Bulova acquires the Wittnauer trademark and some of the assets of Wittnauer International. Bulova also acquires the license for Harley-Davidson watches. Also, in 2001, Womens Wear Dailys Luxury Survey, which measures American womens perception of the most luxurious apparel and accessory brands, ranked Bulova #14 in the watch and jewelry category. Bulova acquires certain assets of Heirloom, a custom woodworking company specializing in the manufacture of grandfather clocks. Operating as a Bulova subsidiary under the new name, Art of Time, Ltd., the Kitchener, Ontario-based facility begins producing high-quality, custom-made Bulova grandfather clocks for sale in the U.S., Canada and Mexico. Bulova also launches a comprehensive international operating strategy to enhance its global positioning while protecting the integrity of the Bulova name by reasserting control over development and marketing worldwide. A key component of the program is the opening of European headquarters in Fribourg, Switzerland, marking Bulovas return to full proprietary operations in Europe after nearly a quarter of a century. 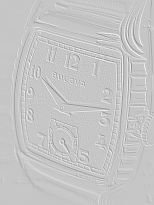 Made in Switzerland, with product development at both Bulova Swiss, S.A. and Bulovas home office in New York, the Bulova European Collection is set to begin distribution on January 1, 2003.